Early this summer Sonos announced they were taking their success with the iOS Sonos Controller and expanding it to the Apple iPad. Today the free Sonos iPad Controller app is finally ready and I was lucky enough to give the new app a quick try this morning with my Sonos System. The Sonos Controller for iPad was built specifically for the iPad to use it’s extra screen real estate. 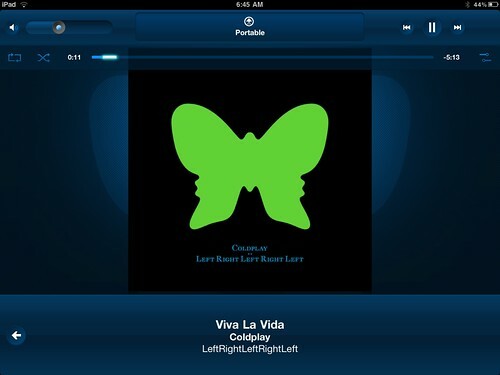 Using the controller you can view your zones, your music and what songs are playing – all at once. Alll screens work in landscape or portrait mode. Searching for an artist and music with the virtual keyboard works well and browsing through your music collection and the online music choices is simple much like the iPhone and iPod Touch app before it. 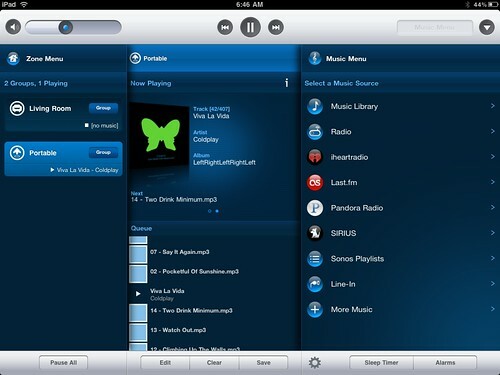 You can also browse, search and drag and drop to create your playlist on the fly. Get a complete view of what’s playing in every zone, complete with full-color album art, elapsed time of a song, and more. Group your zones together or play different songs in different rooms – without interrupting music playback. After I downloaded the free iPad App it required that I update the Sonos System to a new version - 3.3 (more information about this software update here). I was able to do this right from my iPad though with a one-button update. It did take a while – probably a couple of minutes, but after the update I was using the new iPad controller app. The Sonos iPad app is free and available now in the app store. Sonos has an Android app in the works as well so stay tuned! 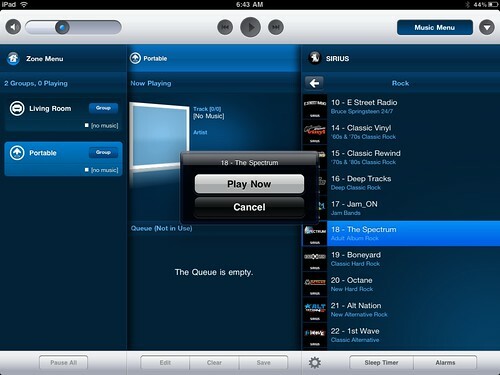 As I use my iPod touch and now my iPad to control the Sonos, I continue to dream of a full-blown, official SageTV iDevice app – one that would stream media to the mobile device. Now that would really make me happy. Read more about Sonos with my Sonos S5 review. I liked it so much I purchased two S5’s after I returned the review hardware.